Here’s a favorite CD compilation that features a track recorded by me and Craig Padilla here in Redding. You can listen to this whole album on YouTube. I really think you’ll like it if you haven’t heard it. The Fahrenheit Project series 1-7 is all available on YouTube. Our selected track “Beyond Beta” isn’t really representative of our overall style. Nor do we seem all that similar to the artists surrounding it. The odd thing is that it all fits together as a whole. Some music compilations can feel like a random mashup. But Project One has a really great sound and feel. It was a real head turning success on many levels, and it obviously spawned at least 6 sequels. It holds up very well for an album released in 2001! It was amazing to me that producer Vince Villuis in Lyon France found our Redding track on the internet, and decided to use it in his compilation. The power of the internet. What interesting times we live in. So here’s a serious question though. I have lately been listening to YouTube in the background, while working in my home office. Not watching, listening. There are a great many entire albums posted there, just like this one. If all these artists’ work is posted there freely, and not by the artists themselves, how is that any different than Napster or Pirate Bay or whatever? Et tu, Google? No answers, only questions here. But the internet has killed a lot of jobs, and it seems to me that on balance, musician is one of them. That’s the power of the internet. The internet giveth and the internet taketh away. If for some reason you like what you are hearing and want to support the artists who created it, you can find more music to purchase at the Ultimae Records website. This entry was posted in Music and tagged Music. Bookmark the permalink. Sunset at the Sacramento River near the rail trestle. I love taking photos and writing about Redding and our beautiful Shasta region. And my daughter and I earn our living helping people buy and sell real estate here. Who do you know that is buying or selling? 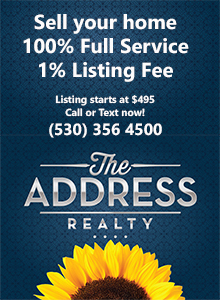 Please let them know about us, and our family brokerage, The Address Realty. Thanks!! Welcome to The Vineyard community in Redding California!